How are we continuing to make our member's ideas become reality? We're providing the services they need. Of course, our stump removal services are competitive with others in the field. Please know your home and where pipes and electrical wires are located. The Paint Manager is not responsible for damage to pipes or wires around the stump. How is our cost calculated? 1. We account for accessibility. 4. The age of the stump. 5. The number of stumps being removed. 7. Clean up not included. Did you know? 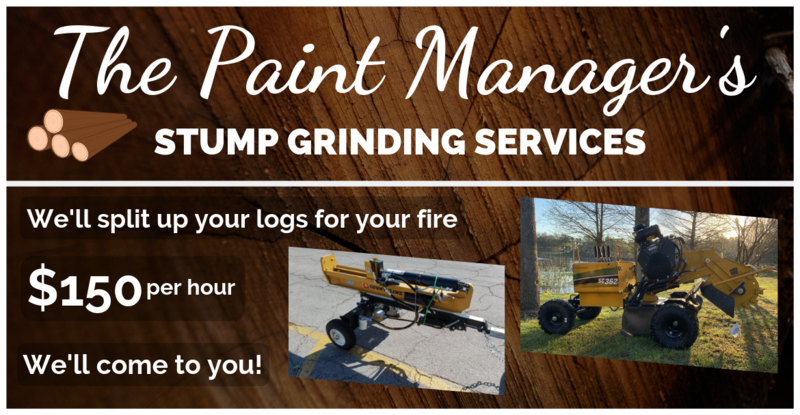 If you become a member of The Paint Manager you can receive up to 25% off your stump removal. Clean up is not Included with your Stump removal service. This service can be added at an extra charge. 3. Clean up minimum fee of $150. You will be asked about clean during your consultation. See our cost estimator to calculate your cost today or Get a quote for our services now. We accept all major credit cards, cash, checks, and PayPal. We serve all of Central Florida area.